We are so blessed in the church with the season of Advent. Advent provides an opportunity for prayer and reflection in preparation of Christmas. This year I invite you each Friday to All Saints’ at 12.30 p.m. for a short time of prayer, bible reading and reflection. Embracing the tradition of Advent with the social preparation for Christmas, provides a wonderful foundation for the true celebration of this important Christian festival. The Parish Gift Day this year will be held on Sunday 10th December. Each year we invite parishioners to give a gift to God to support all the work that is being done in His name in the Parish. Every gift, no matter how small, will be greatly appreciated and we will continue to be faithful stewards and to live by grace in God’s love. The Gift Day envelopes may be given at a church Service or sent directly to the Parish Treasurer. A pamphlet is included with the Union Notes giving details of the different events being held in the Parish between now and Christmas. I hope you will be able to attend at least some of the events which, I am sure, you will find very enjoyable and uplifting. I would like to thank the organisers of the different events for the huge amount of time and effort they are putting in this year and I am sure all the occasions will be very successful. 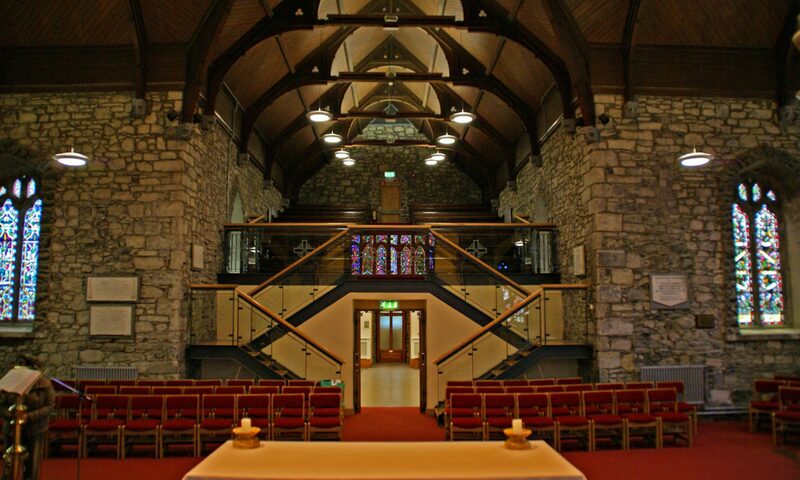 As you know, RTE will be broadcasting the Christmas Day Service from our Parish this year. It is an occasion everyone is looking forward to and I hope you will have the opportunity to watch the Service which will be broadcast on R.T.E. 1 at 11.25a.m. on Christmas morning. In order to enable everyone to see the Service, and also attend church, the Services on Christmas Day morning will be over by 10.30 a.m., giving everyone the opportunity to get home in good time. Every year the Parish gives very generously to the much-needed charitable work that is undertaken by so many organisations and individuals. Last year we raised a considerable sum of money any support you give will be warmly received and appreciated. Each church is always beautifully decorated throughout the year for the special church Services and, of course, the Sunday Services. In All Saints’, Doreen Lynch has kindly agreed to be the organiser of the Roster and to provide assistance the flower arrangers may require. If you would like to provide flowers for worship on a Sunday during the year, please contact Doreen (0876258398) who will be very pleased to hear from you. Church decoration for Christmas will take place on Saturday 16th December from 10.00 a.m. and everyone is most welcome to help in each of the churches. Ailish, who comes from Mullingar, returns to give a special concert in All Saints’ on Friday 15th December at 8.00 p.m. Ailish is a world-renowned singer and performs all over the world, delighting audiences with her amazing voice. If you would like to come to the concert, please contact Doreen Lynch for tickets(0876258398). This year in Killucan, parishioners have suggested that it might be good to have items of non-perishable food given at the Carol Service on Sunday 17th December, and the hamper would then be presented to SVdP, who would distribute the food before Christmas. An invitation is extended to everyone attending the Killucan Carol Service to bring along small items of food. This year two new Christmas Cribs are being prepared for All Saints’ and Killucan churches and we will have two new sets of nativity figures. In both churches the cribs and figures have delighted parishioners over the years but with the passing of time the cribs and figures now need to be replaced. I would like to express the appreciation of the Parish to Peter Cruise, who is building the crib for All Saints’, and Ari Gorissen who is building the crib for Killucan. We look forward with eager anticipation to seeing the results of their handiwork. We offer our deepest sympathy to David and Audrey Leahy, and Adam and Mark, following the death of David’s father, Des, on Saturday 4th November. Des was a much-loved husband, father and grandfather and was held in the highest regard by so many people. He had a very distinguished career as a pharmacist in Dublin before retiring to live in Enfield, Co. Meath. Des bore his illness with great courage and dignity and the family were all gathered by his bedside when he peacefully passed away. We pray that Des, now in the fuller presence of God, will rest in peace. We pray that David, Audrey, Adam, Mark, David’s mother, and all the members of the family will be comforted by their lovely memories of him and by knowing that God’s promises are true, that death is not the end but an entrance into God’s fuller presence. We also offer our deepest sympathy to David and Phyllis O’Malley following the sudden death of David’s sister, Marie. Marie had coped all her life with some health problems, but in the end her death came as a very sad surprise to all the family members. We pray that Marie, now in the fuller presence of God, may rest in peace. We also pray that David, Phyllis, Jennifer and Niamh, and the wider family, will be comforted at this sad time by God’s love and by their loving memories of Marie. We also offer our deepest sympathy to Ari and Jean Gorissen, on the sudden death of Jean’s cousin, Jack, in Canada. As these Notes are going to press, the news has just come in of Jack’s death in a road traffic accident, and so we remember all of the family, particularly Jack’s mother, Jean’s aunt, as they endeavour to cope with this very sudden and sad news. While there is joy at Christmas, we also sensitively remember those who have been bereaved in the Parish during the last year and before. Memories of their loved ones clearly bring a sadness and upset at this festive time of year. We would like those bereaved to know that we fondly and prayerfully remember them at this time. On Christmas Eve at each of the Services, those who have been bereaved and those who are not well and in hospital at this time, will be remembered in the prayers. I would like to wish you all a very happy and Holy Christmas. Wherever you may be spending Christmas this year, I hope you will have a most enjoyable time and I wish you good health and happiness for the New Year. Olive and I would like to thank you very much indeed for your prayers and support for Olive during her illness, which both she and I appreciate beyond words. There is No Tiny Tots Group on the 29th of December – The group will return in the New Year on the 5th January.